This morning Apple held their second big event in just the last few months to WOW us with new specs, features, and devices. You’d think they were talking about a supermodel the way they described their new thin, gorgeous iPad Air 2 and iPad mini 3. And honestly, we agree. We heard CEO Tim Cook talk about the “biggest iPhone launch ever” as he cited the record-breaking sales of iPhone 6 and iPhone 6 Plus. We found out that 48% of iOS users are already using the latest and greatest iOS 8. We received an October 20 date for the launch of Apple Pay, which we also learned will already use 500 banks just to start. And more exciting than ever, we learned that the much-anticipated OS X Yosemite that was announced at WWDC back in June is available for download TODAY! Certainly the most anticipated announcement of the day, Apple revealed their slimmer-than-ever iPad Air 2 and iPad mini 3. Some of the greatest highlights of Apple’s new gorgeous devices? We all gawked at the image of a shaved-down pencil showing the new iPad Air 2, which is 18% thinner than the original iPad Air. Even two of these devices stacked on top of each other were thinner than the original iPad. Now that’s thin. The Verge also celebrated “the world’s thinnest tablet,” but said the second most notable update is the addition of the Touch ID we all love on our iPhone 5s, iPhone 6 and iPhone 6 Plus. Touch ID on iPad Air 2 means easy access and payment within apps, as well as a seamless functionality with Apple Pay in stores. TechCrunch applauds the 10-hour battery life, 8 mp rear camera with slo-mo and time-lapse capabilities, and the latest generation of Apple’s chipset – the A8X, which allows 40% faster CPU and 2.5x faster GPU. “Oh, that lovely new iPad Air 2 screen,” is all Gizmodo could say about the new display that features an anti-reflective coating that reduces glare by 56% – perfect for enjoying your new iPad outside. Visit their page for a hands-on look at the new iPad Air 2 and iPad mini 3 to see which they liked best. In their article “iPad Air 2 goes for the gold,” CNET plays at the latest color for Apple’s tablet line as well as speaks to its crazy successful record. They cited that iPads pull in 15-20% of the company’s revenue, just behind iPhone. As for the new iPad mini 3? Apple kept their bestselling classic as is, with the same Touch ID we see on iPad Air 2, updated with iOS 8, and gold as an added color way. A brand new iMac with Retina display was also announced, available for order now. The new iPad Air 2 and iPad mini 3 are available for order tomorrow, October 17, and will be shipping next week. 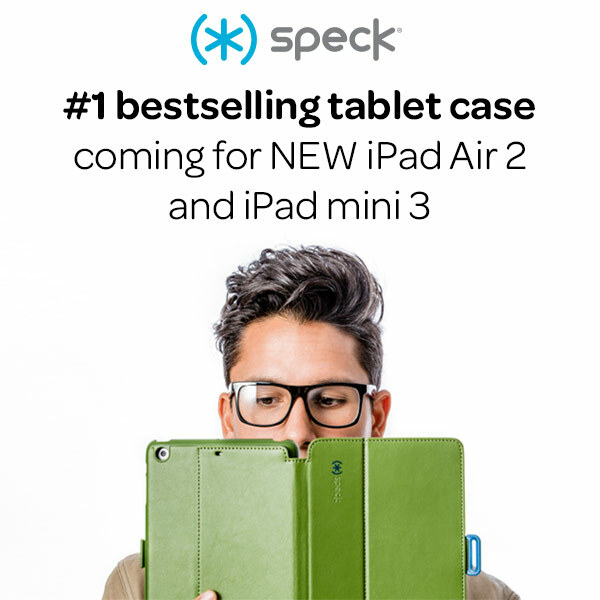 Stay tuned… We’ve got the #1 bestselling tablet case coming soon for the new iPad Air 2 and iPad mini 3. Sign up to be notified when they’re available.